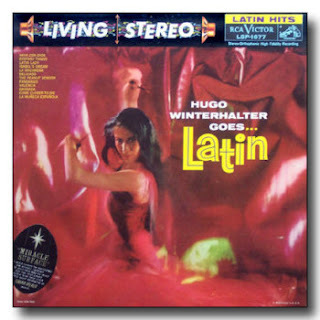 LISTENING NOTES: Diluted Culture: "Hugo Winterhalter Goes...Latin"
Diluted Culture: "Hugo Winterhalter Goes...Latin"
I thought I would mention this lp briefly, if only to remind you that you can't judge a book (or in this case, record) by it's cover. It's easy to be seduced by the lure of the exotic, particularly if you were an American in 1959! Once again, RCA's art department gives us yet another sizzling cover, with our lovely model with castinets and giving you that "come hither" look. She, as well as the set, appear to be on fire! Unfortunately, the heat dies down considerably as Hugo and orchestra attempt to weave a spell. Let's just say it is pleasant background listening with a little spice. In the liner notes, he states that "Athough I've recorded Latin compositions in the past, this album was the first real opportunity to fulfill my ambitions along that line." I suppose my expectations were too high, after all, Winterhalter was born and educated in New England, not old Havana. 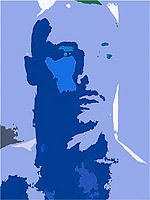 For an excellent article covering the many highlights of Winterhalter's career, try this. As for sound quality, it serviceable, but not up to the best Living Stereo productions. It was recorded by Joe Reisman at Manhattan Center, a location that didn't seem to yield any of the best Living Stereo recordings. Worth picking up, but not for a premium.